Sustainability issues are widely recognized as wicked problems, which should not be considered as problems to be solved, but as conditions to be governed. There is a general agreement on the need to reform scientific expertise to deal with sustainability challenges, by developing new ways of knowledge production and decision-making. In that sense, Sterling maintains that the nature of sustainability requires a fundamental change of epistemology and education. Transdisciplinary approaches to knowledge emphasize phenomena complexity, disrupting and transcending epistemological structures to progressively reflect and gain understanding. In relation to engineering education, the Barcelona Declaration highlights the sustainability competences, that engineering students should achieve. The Universitat Politècnica de Catalunya (UPC Barcelona Tech), aware of the new sustainability competences that engineers should have, offers a master degree in Sustainability Science and Technology that trains students to become agents of change for sustainability. Transdisciplinarity (Td) and Service learning (SL) are approaches applied. Learning environment, challenges and lessons learnt when applying such learning approaches are explained in following sections. 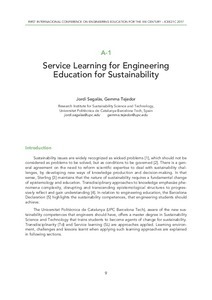 Segalas, J., Tejedor, G. Service learning for engineering education for sustainability. A: International Conference on Engineering Education for the XXI Century. "ICEE21C 217: 1st International Conference on Engineering Education for the XXI Century: Castelló, Spain: July 6-7, 2017: proceedings book". Castelló de la Plana: 2017, p. 9-12.